You are here: Home / Headlines / Gene Expression - Molecular Biology / CRISPR genome editing: which cell line to choose? 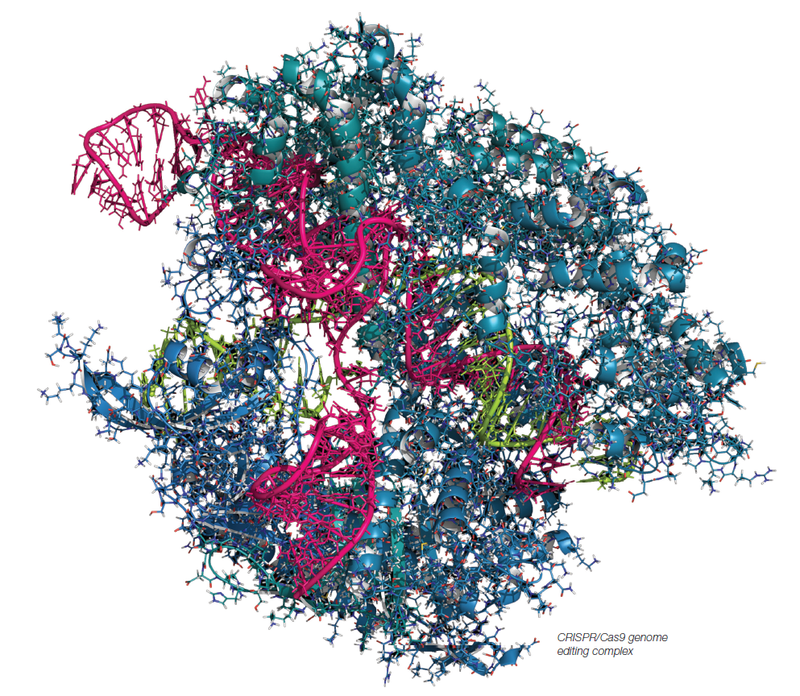 CRISPR Cas9 genome editing complex. Because of the great demand for this ability to create cellular models with complete gene knockout, reporters under the control of an endogenous promoter, etc., there has been an explosion in the commercial offerings of products and services around this technology. For example, to make the targeted break in the genome, the Cas9 protein and sgRNAs must be introduced to the nuclei of cells. The H1299 cells and HEK293T cells stably expressing Cas9 carry a copy of Cas9 in the AAVS1 safe-harbor site in their genome. Such a cell line would be useful for experiments using commercially available sgRNA libraries to screen for genes involved in a particular phenotype. A similarly vast selection exists for producing sgRNAs. GeneCopoeia, for example, has a vast catalog of sgRNA-encoding mammalian expression constructs for nearly any gene that one can find using their search engine. Other users may prefer to transfect cells directly with sgRNA/gRNA produced by high quality RNA suppliers. This latter option allows users to try innovative approaches such as using chemically-modified mRNAs, DNA-RNA hybrid molecules, and pre-assembled sgRNA complexes. The custom RNA inquiry form from tebu-bio will put users in contact with a specialist to help design custom sgRNAs. The majority of researchers we have talked to have been moving away from classic laboratory cell lines (e.g. HeLa, 293HEK) over the past 10 years, so their initial thoughts are to generate CRISPR-modified cell lines using the more disease-relevant cells they are now using in their labs. Many of these are primary cells that are better modified using lentivirus-based approaches, and the up-front cost required to modify the genome of a non-immortilized cell is prohibitive. Some of the more disease-relevant cell lines are difficult to transfect and/or have non-diploid chromosomal content. To make a simple knockout using CRISPR technology is fairly straightforward, but if the transfection efficiency is low and if there are more than two copies of the gene in the genome the chance of generating a complete knockout is reduced. After all of these concerns, some researchers reach the conclusion to just return to the most easy laboratory cell lines, such as HeLa and 293HEK that are easy to transfect, grow well and from which colonies can be selected. HeLa cells, however, are estimated to have 76-80 chromosomes rather than the normal 46, which means they may have 4 copies of whatever gene you are trying to modify. 293HEK are thought to be hypotriploid with 60 chromosomes. Furthermore 293HEK cells have the notorious detachment problem that makes microscopy studies difficult. Some researchers we’ve talked to have eventually chosen RPE-1 cells as a diploid cell line for genome editing projects. These are retina epithelial cells immortilized with hTERT. The main problem with these cells is rather low transfection efficiency, so it would be advised to test various commercially-available transfection methods prior to beginning the genome editing project. Another diploid cell line that is popular is HT-1080, which is a fibrosarcoma cell line that is easy to transfect. We have talked to some of the experts at GeneCopoeia performing genome editing services and they indicate that HT-1080 cells are quite easy to work with. Interested in setting up a genome editing project?